4-Word Review: Man can she scream. Four young adults on a summer trip inadvertently come into contact with a mutant family and their chainsaws. This is the type of horror film most others strive to be, but usually never succeed. The tension builds right from the start. It’s slow but consistent and eventually hitting on an almost unparalleled level. Director Tobe Hooper and cinematographer Daniel Pearl make terrific use of the location shooting. Between the music and visuals you are given an otherworldly sense. The atmosphere literally hugs you with the dementia of the situation. You feel as engulfed with it as our heroine Sally Hardesty (Marilyn Burns). 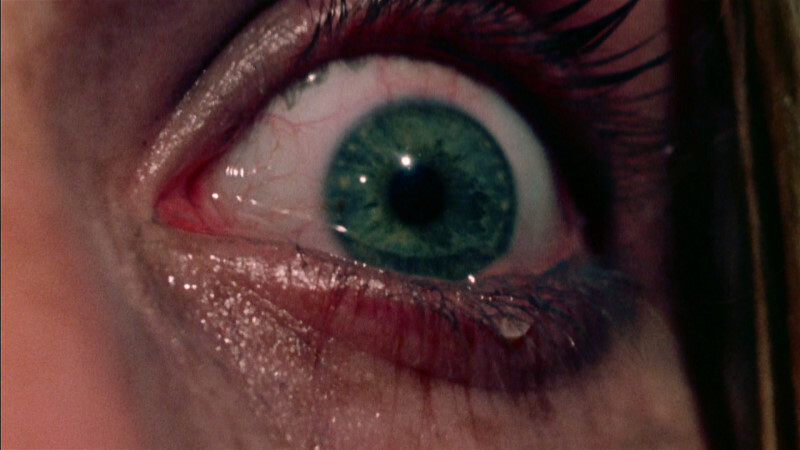 It transcends most other horror films simply because of its intensity and grotesque perspective. It blends so many unusual things together and yet everything still works. It’s both artsy and raw, moody and exciting, humorous and ugly and a masterpiece in many ways. If you are looking for gore you may end up disappointed. Despite its reputation there really is very little if any. Apparently they were going for the ‘PG’ rating, but even so certain scenes become almost laughable with their restraint. One scene in particular features Leatherface (Gunnar Hanson) jumping out at a man in a chair. He jams his chainsaw into him and yet only small droplets of blood can be seen coming out. There is also the problem of Marilyn Burns running. By most crew accounts she was a slow runner. This caused problems because it would allow the assailants to actually catch up to her even though they weren’t supposed to. Both Hansen and Edwin Neal as the Hitchhiker have to do some goofy things to avoid reaching her. This is obvious in the final chase sequence and it hurts the tension a bit. I still feel though that Marilyn was a good choice for the part. Her face holds an authentic look of terror and her screams reach amazing decibels. The graphic close-ups of her eyes are astounding and memorable. This film makes its sequels look awful. A good companion to this picture is Hooper’s follow-up film Eaten Alive. It has the same atmosphere and intensity and is interesting in an equally odd way with Neville Brand making a unique villain. 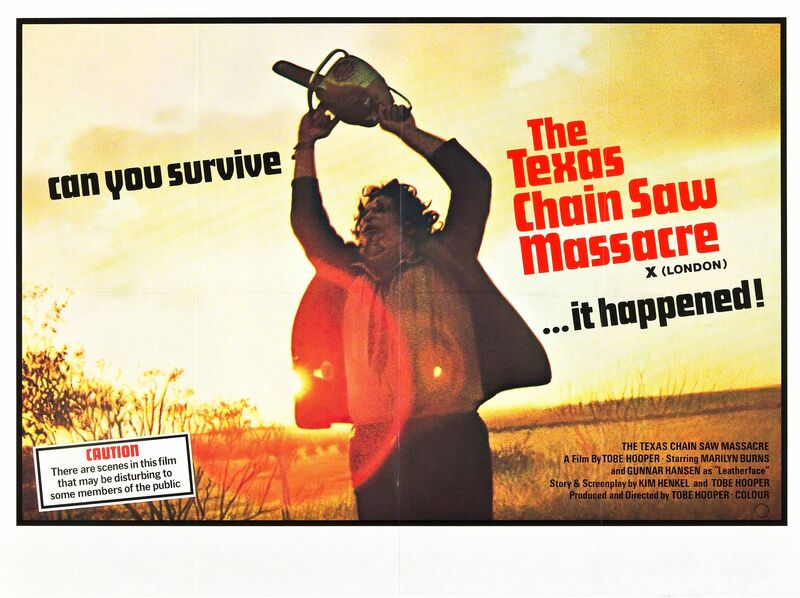 This entry was posted in 70's Movies, Black Comedy, Classic, Cult, Horror, Low Budget, Moody/Stylish, Movies Based on Actual Events, Movies that take place in Texas, Movies with a rural setting and tagged 70's Movies, director tobe hooper, Entertainment, Horror, Movies, Review, sally hardesty. Bookmark the permalink. This movie was rated PG?!!? I also remember the scene where she meets that guy in the gas station (?) and he leaves without shutting the door. So subtly unnerving. My only regret is that when I was in Austin in 2008 and at the site of where the movie was filmed that I didn’t just climb over the fence and take a picture of the site where the home once stood. Of course the home itself has been moved and is now a diner, but remnants of the foundation at the time was still visible. Supposedly they were getting ready to build a office complex there. Very interesting review, I prefer this one to the remakes. I agree with you vinnieh. I wished they hadn’t even attempted to remake it. I found it interesting when watching it that it hardly had any gore in it, all of the brutality was done effectively by the use of suggestion . Once Sally (Burns) is the lone survivor the film becomes tedious and sadistic with grandpa…but the first hour is very tense and shows gore isn’t necessary for horror.